RICHARD PHILIPS-JONES would like to introduce you to the most frightening of beasts on film – the British Werewolf! 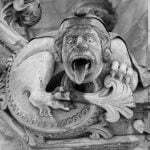 The Werewolf’s place in British horror has never been as prolific as that of, say vampires, perhaps because the form doesn’t have the British literary equivalent of a Dracula, or indeed a Frankenstein. A werewolf subtext to Dr Jekyll & Mr Hyde has been suggested by some, but I would argue that the sub-genre’s real progenitor is the work of American Guy Endore – his novel, The Werewolf Of Paris (1933) was a best seller and set much of the template for cinematic lycanthropy. Universal Pictures established the Brit connection, casting Henry Hull as The Werewolf Of London (1935). Whilst not one of the studio’s most successful horrors, it wasn’t without interest, and the studio gave the subject another try, hitting the jackpot with The Wolf Man (1941). This time around, the doomed Lawrence Talbot was a Welshman, even if star Lon Chaney Jr didn’t attempt the accent. He was, however willing to spend hours in the make-up chair for the transformation scenes, a defining staple of the genre which Hull had refused to endure. It’s interesting that neither film really drew on Endore’s novel, despite the fact that he was by then employed in Hollywood as a screenwriter for such as Mark Of The Vampire, Mad Love and The Devil Doll. Worth a mention for its London setting is Columbia’s quickie Return Of The Vampire (1943), which had the novel idea of Bela Lugosi’s Count Tesla (revived by a WWII bomb!) turning the unfortunate Matt Willis into a Werewolf and making him his slave! Universal, meanwhile sent their creation into Frankenstein Meets The Wolf Man (1943), a far better film than the catchpenny title might suggest, before an increasingly silly series of multi-monster flicks led to Chaney’s farewell to the role in Abbott & Costello Meet Frankenstein (1948). She-Wolf Of London (1946) came along at the dying end of Universal’s original horror cycle, and was more of an occasionally engaging mystery thriller which ultimately promised more than it delivered. Britain’s entry proper into lycanthropy was something of a happy accident. Hammer had built sets for a planned film about the Spanish Inquisition, but the BBFC made it clear that they would reject any film of this nature. Thinking fast, they quickly adapted Endore’s original novel, transplanted the action to Spain and the classic Curse Of The Werewolf (1961) was born, with a powerhouse performance from Oliver Reed and more than enough risky material to get the censors hot under the collar. A segment of Amicus’ Dr Terror’s House Of Horrors (1965) found Neil McCallum the unsuspecting participant in a plan to relieve a Werewolf of his curse, mixing the legend with spooky old house elements. Moving into the next decade, Cry Of The Banshee (1970) is often dismissed (with some justification) as a poor imitator of Witchfinder General, but it does have the novel idea of a magistrate (Vincent Price) and his family being targeted by a wolf-like Sidhe, summoned by the witches he has persecuted. Endore’s source novel was referenced (uncredited) in Legend Of The Werewolf (1975), a production of Tyburn Films, who valiantly attempted to revive the British Gothic film in what seemed its darkest hour. Despite a miniscule budget, director Freddie Francis managed to pull off some effective moments, and the screenplay from former Hammer scribe John Elder (aka Anthony Hinds) reintroduced some of the political/economic overtones of Endore’s source. Whilst the British horror film generally struggled through the 1980s, our fair isles actually produced two bonafide werewolf classics in this decade, and very successful ones at that. 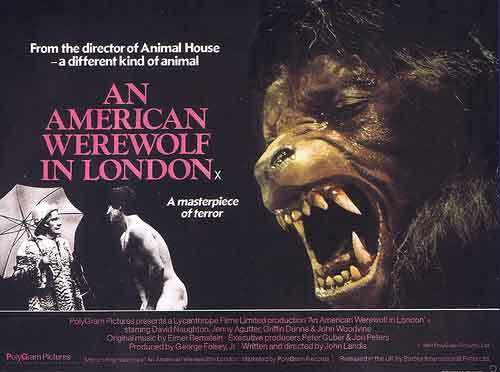 Not a Brit lycanthrope precisely, but certainly UK based was An American Werewolf In London (1981). US director John Landis was evidently a fan of Brit-horror, and revelled in its traditions whilst dragging them firmly into the new decade. In a perfect world, it should have kick-started a second golden age of UK horror films, but it was not to be. Another possible new direction was offered by Neil Jordan’s The Company Of Wolves (1984), co-scripted with Angela Carter from one of her short stories. This was expanded and woven into a nightmarish stream of consciousness, throwing in a liberal helping of Little Red Riding Hood, as a metaphor for a young lady’s coming of age. The result was a remarkable visual feast on a small budget. If you’re new to the world of the werewolf, I’ll wager the above films represent the ideal starting point, and I envy you the sensation of seeing them for the first time. Happy viewing! You've got to be Choking!